Older adults can lose body heat fast—faster than when they were young. A big chill can turn into a dangerous problem before an older person even knows what's happening. Doctors call this serious problem hypothermia. If you work or play outside during the winter, you need to know how cold affects your body. Being active in the cold can put you at risk for problems such as hypothermia and frostbite. 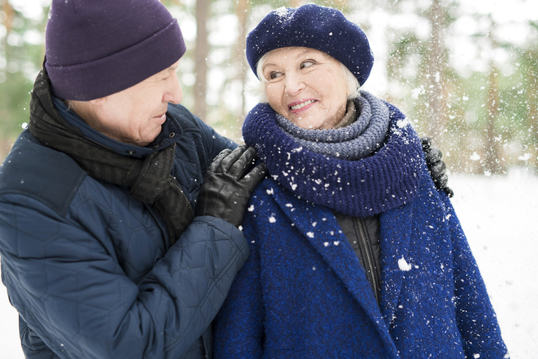 Snowstorms and extremely cold weather can be very hazardous to older adults. Are you prepared for a winter-related emergency? MedlinePlus can assist you in preparing with our winter weather emergencies health topic page. This handy guide from the CDC can help you prepare for times of extremely cold weather. What you'll need, how to stay safe and warm, and how to avoid winter-related injuries. Exercise has benefits all year, even during winter. But before you brave the cold, take a few extra steps to stay safe. Looking for a meal that’s easy to throw together on a busy night? Try our healthy recipe for Chicken Picadillo. This email was sent to Email Address. Please click here to unsubscribe from the My MedlinePlus Weekly Newsletter MedlinePlus email list. To change your subscription preferences or stop subscriptions, log in to your User Profile with your e-mail address. For questions or problems with this service, please contact Help. This is a free service provided by MedlinePlus and the U.S. National Library of Medicine. To contact MedlinePlus, use our form.